At least 45 people were killed and over 120 injured on Sunday when a suicide bomber blew himself up at the Wagah Pakistan border crossing to India, near Lahore. The suicide bomber walked past four check posts. When he was finally stopped at a check post, he blew himself up. Some reports indicate that a gas cylinder exploded. 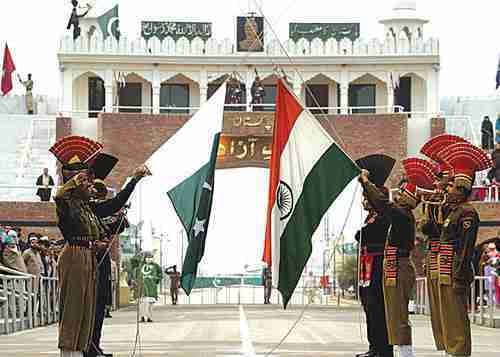 Wagah is the only border crossing between India and Pakistan. The crossing closes every day at sundown, at which time there's a very colorful flag-lowering ceremony in which both Indian and Pakistani rangers participate. Hundreds of people, including families with women and children gather on both sides of the border to see the display of military pageantry. The suicide bomb was timed to explode when crowds of people on the Pakistan side were leaving the ceremony, heading for the parking lot. No Indians were injured. The disintegration was on display on Sunday, as three different groups claimed responsibility for the Wagah bombing. One TTP faction said they carried it out to avenge the killing of a Taliban leader in a U.S. drone strike last year. The Jamat-ul-Ahrar faction, which broke away from the main TTP leadership in September, said THEY were responsible, to avenge the ongoing Pakistan army military action against the Taliban on the border with Afghanistan at the opposite end of Pakistan from Lahore. A third militant faction, Jundullah, has also claimed credit. As we reported yesterday, the Islamic State / of Iraq and Syria (IS or ISIS or ISIL) has been specially targeting the Abu Nimr tribe, one of the few Sunni tribes that have been actively fighting against the ISIS as it approaches Baghdad. Mass killings have killed 322 members of Abu Nimr. More than 50 bodies were found in a water well, while 65 members have been kidnapped, and are being held as hostages. The latest attack occurred on Sunday morning, when at least 50 were killed. Now Abu Nimr leaders are claiming that the Shia government in Baghdad encouraged them to fight ISIS, promised them weapons that never came, and then left them to be massacred. They are claiming that they provided coordinates for U.S. air strikes, but they were ignored. "Yeah, and an incredible experience. What we saw inside Iran was extraordinary, heartbreaking, confusing, inspiring, and very, very different than the Iran I expected from always - you know, from looking at it from afar, from a geopolitical sense, what we read on the news, what we know from that long and very contentious relationship we've had as nations. [The most surprising thing was to] walk down the street as an American and have total strangers constantly saying where are you from? America? You know, have you tried our food? Thank you for coming. I'm so -- just outgoing, friendly, welcoming to strangers to a degree that we really experience very, very few places and I'm talking Western Europe and allied nations. We were really - we'd been told to expect that, but you're thrown by it when you face it everywhere. Our producer was -- it was his birthday and we all went out with our local crew to a very crowded restaurant, traditional Persian music and Iranian families eating and someone found out that my producer -- it was his birthday, the entire restaurant sang "Happy Birthday" to him and they presented him with a cake. It was a very different Iran than I had been led to expect or could have imagined. [You] see how careful people are, of course, and they are very cognizant that the -- what's OK right now might not be OK in five minutes as far as behavior. But it feels a lot like Barcelona for a few minutes at a time, and we went at one point -- hung out in a parking lot in Tehran late at night with all these young Iranian kids who collect American muscle cars and basically hang out and order up pizza and rev their engines and collect, you know, mustangs and challengers, and for a minute you can be forgiven for thinking it's southern California. The kids like any other - It's a very young country, of course. So the disconnect between the hard- liners and the people who run and control the country and the Iran you see and feel on the street is very jarring and I think people are - it's just going to blow people's minds when they see it." Reading this, you can see the reason why I've been saying for ten years that Iran was going to become our ally. It actually began to be obvious in the early 2000s, when college students began having pro-American demonstrations. Iran is in a generational Awakening era, just one generation past the 1979 Great Islamic Revolution and the Iran/Iraq war that climaxed in 1988. The generation of children that grew up after the war are rebelling against their parents, just as American children rebelled against their parents in the 1960s. Iran is having a "generation gap," just as America had a generation gap splitting the survivors of World War II from their children, the Boomers who grew up after the war. Iran's hardliners are the survivors of the Great Islamic Revolution. As each year passes, there are fewer of them, and more of the younger generation, which likes the west, and has nothing in particular against Israel.